Prince Harry and Meghan Markle may have been out of the spotlight for a few days, but a new photo from one of Queen Elizabeth II's residences has given the public another adorable glimpse of the new Duke and Duchess of Sussex. 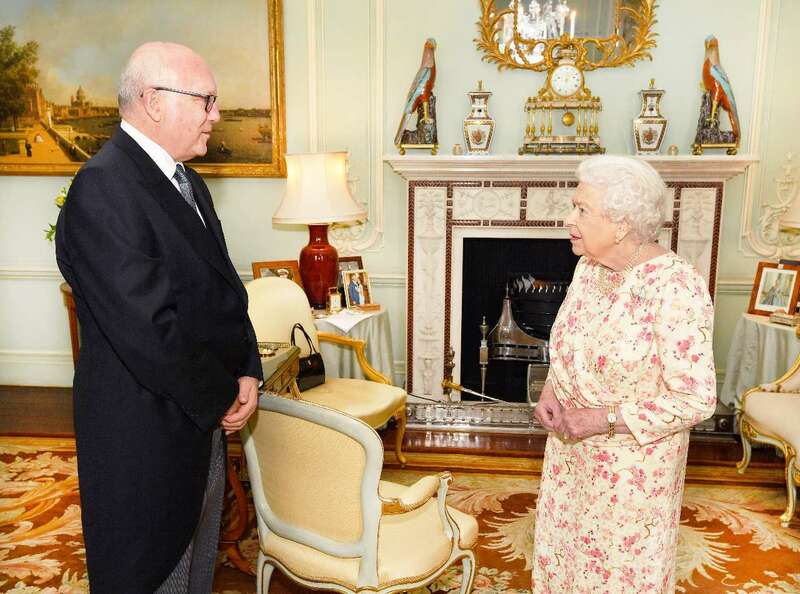 The monarch had a meeting with George Brandis, the Australian High Commissioner to the United Kingdom, on Wednesday, with the pair being photographed together inside Buckingham Palace. 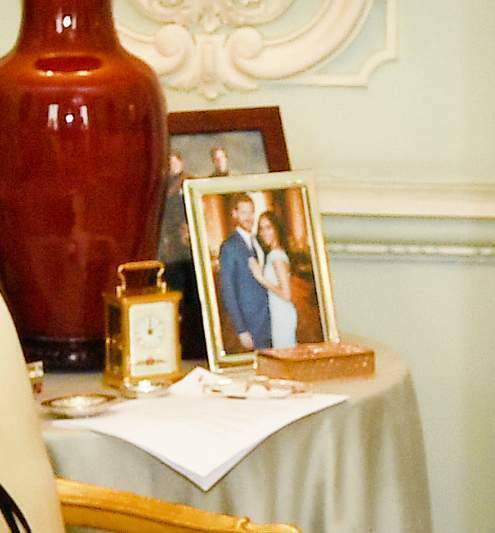 Eagle-eyed viewers will notice that one of the framed photographs sitting on a side table next to the fireplace contains a shot of Markle and Harry that had previously never been seen. The photo sees the duke and duchess standing side by side, with Markle's hand resting on Harry's chest as the pair post in coordinating blue ensembles, Markle in a light blue dress and Harry in a navy suit. It's unclear when the photo was taken, though it was likely before the couple's May 19 wedding. After making an appearance at Prince Charles' birthday party last week, Markle and Harry have reportedly jetted off on their honeymoon, though the location is a closely guarded secret. While the couple was previously rumored to be honeymooning in Africa, TMZ reports that Markle and Harry will be honeymooning at Alberta, Canada's Fairmont Jasper Park Lodge, and staying at the 6,000 sq. ft. Outlook Cabin. The resort has reportedly prepared by ordering gear they don't normally keep on hand, and while it's unclear when Markle and Harry will arrive for their vacation, there will be plenty of security involved when they do. On the flip side of this rumor is a denial from the resort that Markle and Harry will be staying there. “Though Fairmont Jasper Park Lodge has a longstanding history of serving as a royal retreat, we can confirm that the couple is not currently booked for a stay,” a representative for the property told PEOPLE in a statement. The Fairmont Jasper Park Lodge has a royal history, as King George VI and the Queen Mother, as well as Queen Elizabeth and Prince Charles have all stayed there in the past. Previous reports indicated that Markle and Harry were heading to Namibia for their wedding, so it's unclear where they will actually choose to spend their honeymoon. The couple's getaway was originally delayed so they could attend Prince Charles' party, and Kensington Palace has explained that the details of the honeymoon will be private, as opposed to the very public aspect of the pair's wedding.